As radio frequencies moved up into the UHF realm of 30 MHz (through 3 GHz), designers noticed that the old methods and equations for winding inductors (aka coils and chokes) no longer performed as predicted. The culprit was stray capacitance created by the wire itself and the insulation between windings. To some extent, the length of leads running from the inductor windings to connection points (terminal strips and lugs at first and then later printed circuit boards) generated enough extra inductance to add noticeably to total inductance. New methods were developed to help mitigate the effects of these stray (aka parasitic) reactances. Much new knowledge in this area was gained through the war efforts with many radar and radio designs coming online during the time. With the assignment of many services to higher frequencies, the electrical characteristics of component parts must be carefully analyzed. Fig. 1. Photographs of several r.f. chokes that can be used depending on the operating frequency. (1) Broadcast type coil, used effectively up to 10 mc. (2) Used extensively at frequencies from 10 to 180 mc. (3) Air-core type solenoid used at higher frequencies. With the advent of FM and television, the radio serviceman, who for the past twenty-odd years has been ably repairing amplitude-modulated (AM) broadcast receivers, must now familiarize himself with good design and construction technique in the recently assigned high-frequency bands. A thorough working knowledge of the various problems which become apparent at high frequencies will not only increase the pleasure that a radio amateur can extract from his hobby, but will also be very profitable, for in the immediate future the majority of sets brought into the small service station for repair will be high frequency FM and television receivers. With an eye to the future, this article will discuss the design and application of radio frequency chokes in the new v.h.f. bands. 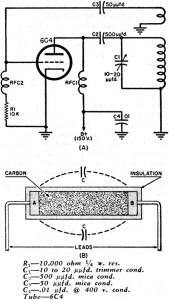 A typical circuit uses the 6C4 and is capable of delivering about four watts maximum output. With improper choking, as much as two watts may be lost in the power pack, leaving only two watts, or 50% maximum power, available as useful output. This condition also exists and is even more serious in high power transmitter oscillators. Fig. 3A also includes a choke, RFC2, in the grid-leak circuit. Most setups require this choke, as its omission may be cause for the oscillator to cease operation. A diagram of the typical grid-leak resistor is shown in Fig. 3B. 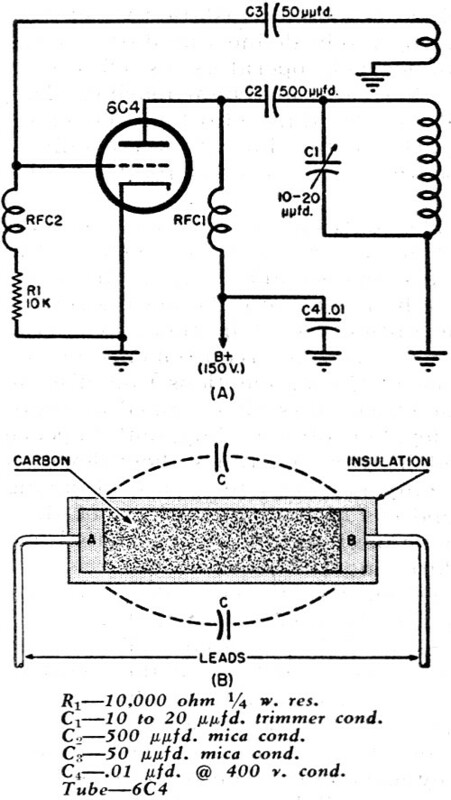 A carbon rod forms the resistive element, which is flanked on each side by small round metal plates, A and B from which the terminal leads are brought out. Bakelite or ceramic covering is added as insulation. A stray capacity exists between these plates, A and B, which at high frequencies may be of such magnitude as to bypass enough of the signal from the grid to ground to prevent oscillation. In the 200 to 600 megacycles per second section of the frequency spectrum, transmission lines make then appearance as tuned circuits for power oscillators. At these frequencies another problem appears. High percentages of the power may run down the leads of the filament and be lost in the filament transformer. Correction of this condition is essential since the same problem exists as did with improper plate supply chokes. Fig. 2A illustrates the application of r.f. chokes in the filament leads, and one of a number of correct methods of grounding. As the frequency approaches 600 megacycles, and above, however, it becomes convenient to feed the heaters through tuned transmission lines, which then act as r.f. chokes. Fig. 2. (A) In higher frequency applications r.f. chokes must be employed in the filament circuits to prevent oscillations. Proper method of grounding is shown. (B) Circuit for grid bias modulation. R.f. choke prevents r.f. from entering modulation transformer. Confining r.f. to particular sections of a circuit and eliminating it in other sections is another use to which r.f. chokes are put in modulating apparatus. In Fig. 2B a circuit for grid-bias modulation is shown. Here the r.f.c. prevents the r.f. from flowing in the modulating transformer. Of course there are many other applications of r.f. chokes, but those which are most important and those which the average radio serviceman or radio ham are most likely to encounter have been included in the above discussion. 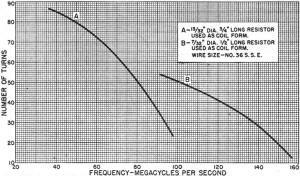 An important characteristic of chokes which is very often forgotten or ignored is that the choke must be a very high impedance at the operating frequency and not just a high inductance. If this condition is not fulfilled a serious detuning of the tank circuit may result. This statement at first appears paradoxical, but can be easily explained with reference to Fig. 5. It shows a number of coils of wire wrapped around a Bakelite form. Small capacities (distributed) exist between each pair of turns on the coil. Classically a condenser consists of two flat plates of a conducting material separated by an insulating dielectric. In this case the two turns of wire form the plates and the interspace air forms the insulator. A condition of this nature exists with every coil. 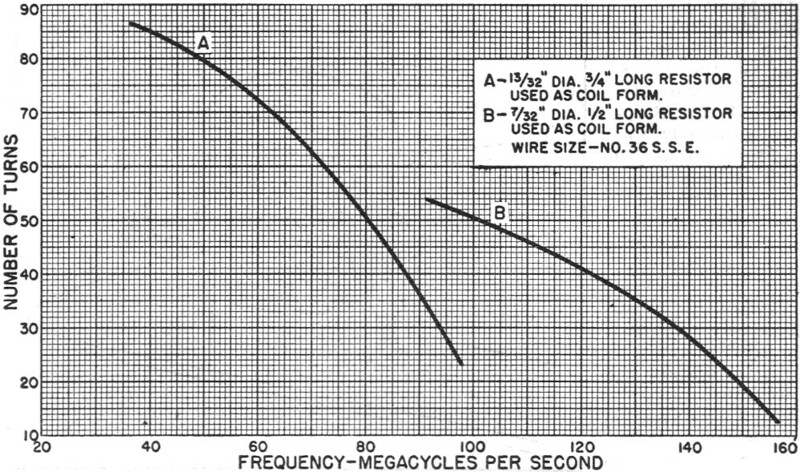 Even though the distributed capacity is small, it is impossible to make it zero; therefore, the optimum in choke design appears when the inductance of the coil resonates with its own distributed capacity at the operating frequency. Fig. 3. (A) Diagram of FM local oscillator, shows most common application of r.f. chokes. (B) Common grid-leak type resistor. In actual practice, self-resonance is almost impossible to obtain exactly, because stray capacities which arise in the circuit wiring almost always detune the choke somewhat, but a condition as close as possible to the goal will pay the highest dividends. Too many turns will result in a very large stray capacity and, at a frequency any appreciable amount above resonance, the choke will appear to be a shunt condenser. A Boonton Q Meter is an excellent instrument on which to measure resonant frequencies of chokes, but since such an instrument is expensive and therefore not available to the average amateur, several graphs are included to aid in the design of high-frequency chokes. Other characteristics of chokes that are important are the current carrying capacity of the wire, which must be high enough for the desired application, and the resistance of the choke, which must be low enough not to cause an appreciable voltage drop. Fig. 4. Design chart shows approximate number of turns vs. frequency for r.f. chokes. Remembering this construction hint will save many hours of time search­ing for the cause of trouble in new FM sets. Now for a sample design of a choke. 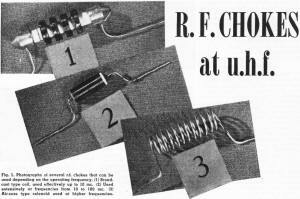 Sketches of several chokes used at various frequencies are pictured in Fig. 1. Type 1 is used mainly in the broadcast band and up to approximately 10 megacycles. Construction of this of choke is difficult, as it necessitates the application of a universal coil-winding machine and is therefore out of the scope of most amateurs and radio builders. Choke number 2 is useful for frequencies from about 10 megacycles up to about 180 megacycles. Above this frequency, air-cored solenoids, type 3, are used. Ceramic insulated resistors, with values ranging from 1 megohm up, provide the best form on which to wind a home-constructed choke. This material has about the least losses of any readily available. Isolantite is used commercially, but this is essentially the same thing. The 1-megohm resistance is high enough so that its effect upon circuit Q's is negligible. Another advantage of a resistor is that its terminal leads are excellent in facilitating the use of short connections. All choke connections at high frequencies should be as short as it is possible to make them. This point cannot be overemphasized, as long leads add dangerous amounts of inductance and capacitance at the frequencies used in the new FM band. An excellent illustration of this condition can be shown by the following analogy: A lead 1" long at 100 megacycles has the same inductive reactance that a lead 8'4" long has at standard broadcast frequencies. How absurd it is to think of hanging an 8-foot connection lead in an AM receiver. Fig. 5. Distributed capacities that will have effect on the operation of choke. Let's say a choke is desired for the plate circuit of a local oscillator of an FM set (Fig. 3A). An excellent high-frequency oscillator tube is the Radiotron 6C4 miniature triode. The first factor that comes into considera­tion is the current that the plate will draw at maximum output. In the design chart shown in Fig. 4, values are given for chokes wound on two dif­ferent sized cores, using No. 36 single silk enamel wire. The No. 36 wire can carry 25 milliamperes. One watt, 13/32" -diameter, and one-quarter watt, 7/32" -diameter, ceramic insu­lated resistors are the two sizes of forms covered by the chart. Plate current in a small receiving tube is generally not over 25 milliamperes, so the No. 36 wire will suffice for this circuit. A point in the middle of the band is the optimum frequency to choose for the design. The present band is 88 to 108 megacycles; therefore, 98 mega­cycles will be the design frequency for our choke. On the chart, using a 7/32" form, it can be seen that 51 turns will fulfill the specifications. To begin construction, sandpaper the marking paint off the body of the resistor and solder one end of the wire to a terminal lead. After wind­ing the required number of turns, cut the wire to size and fasten it to the other lead with solder, being careful to keep the coil tight, neatly wound, and closely spaced. If the design chart has been followed with any degree of accuracy, a choke has been made that is applicable in either the plate or the grid leak circuit of the oscillator, RFC, and RFC, of Fig. 3. Two identical coils should be wound. 3. Do not use inferior components. Even though u.h.f. is a new field, the amateur or radio serviceman should not hesitate for a moment to enter it, for it is an unexplored wil­derness with great opportunities for fascinating home research.